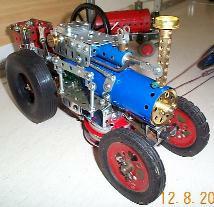 the Melbourne Meccano Club Inc was held at the Bri Phil Hall, Elsternwick on Sunday 12 August. A good number had already gathered outside in the warm (for Melbourne anyway) almost spring-like sunshine when the doors were opened at 1 pm. By the time for the meeting began we had 38 members and wives and 2 visitors. Once again several members had brought along models - some more than one and what with viewing these, participating in general chit chat and inspecting the wares on the various sales tables the first hour passed very quickly. Our Treasurer advised that subscriptions be maintained at their current level. Note that subscriptions are now due and must be paid by 15 Dec 2001. I noticed at the meeting that Mike had his receipt book at the ready - I doubt that many of those present escaped paying thanks to Mike's gentle persuasion. Willem Secker brought along his version of the "bombing game" with a lethal looking bomb with a sharp point. His other models were a Container Crane and a bucket Excavator (both from the No 5 French set) and the breakdown crane from the 301 set. 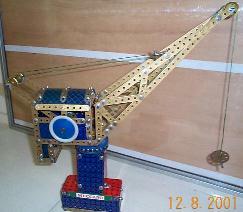 Wes Dalefield had the crane from the Centenary Crane Set as well as two models from his 7 year old son. The camera made ingenious use of a No2 clockwork, motor to simulate the sound of the motor wind. 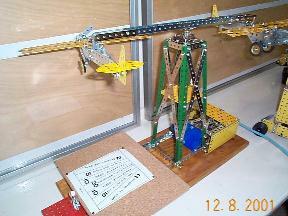 Ron Bassee showed off some of his almost pristine blue-gold plates in his model of the Jib Crane (R/G No 4, 1950's) - one of the better set models in my view. As well there was an interesting mechanism: Three Cylinder Radial Oscillating Steam Engine (used to drive torpedoes according to Kimball). Kimball Monger's models had an agricultural theme, perhaps reflecting the farming activities of his forebears in Kent. There was a Twin Drum Ploughing Engine (from a MM Quarterly) which dragged either a 3 Furrow Mould Board Balanced Plough or a Mole Drainer and of course a Land Anchor (ask Kimball how it all works). Finally there was his water & spray tanker. 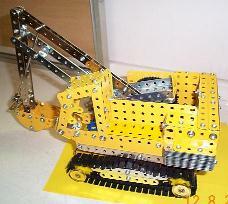 Mike Maloney has been unpacking some more of his Meccano since his move and produced an attractive Trench Digger (Midlands MG magazine) in yellow/zinc comprising mostly Meccano parts according to Mike. 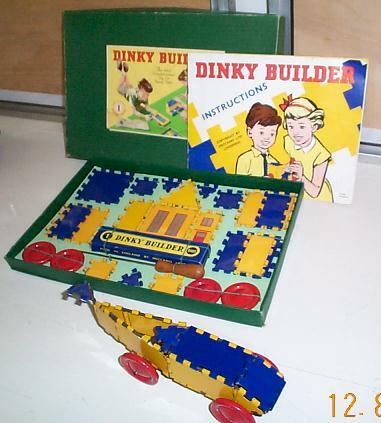 It was intended as a Dealer's model and Mike proposes to mount it on a wooden plinth. Roger Hall had a Recovery Vehicle (using some nicely refurbished parts) from the 1970's Highway Multikit. His attempt at a model from the Meccanoids set was less successful - too highly geared. Peter During showed us Drop Hammer from the 1970's No 3 set as well as a part-finished Octopus Ride from the No 6 set. Tony Press showed off a model from one of his recent finds - the Anti-Aircraft Gun from the 1940 Mechanised Army Kit, (using some of Jack's specially finished replica parts to avoid creasing flexible plates). Apparently these early guns could not fire as high as the "Jerry" planes were flying but at least made the civilians feel better. 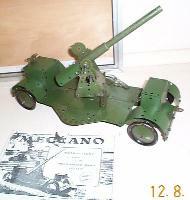 To demonstrate advances in military and Meccano technology over 24 years Tony also had a set of nickel models - field gun, with shell carrier and tractor from 1916. John Hutchinson provided an extension to the historic display with a model of a tracked army truck from the 1970's Army Multikit. Keith Guilliard demonstrated his model of a Stationary Steam Engine. It is a copy of a model originally built for a shop in Queensland and is noteworthy for its elaborate and neat mechanisms. 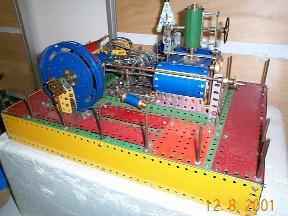 Graham Jost produced another of his mechanisms showing a parallel shaft offset Oldham coupling. This uses two halves of a Meccano dog clutch with a special sliding centre coupling (acquired during a recent visit to Skegness). Barry McDonald showed us his handsome (yet to be completed) model in red/green of the Runcorn Transporter Bridge. Tony Van Wageningen is planning to build a large windmill in Meccano and brought along a cardboard mock-up of the lower part of the structure. 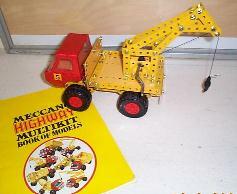 He had an actual Meccano model as well - a fork lift log carrier from a No 40 French set. Dave Doddrell presented a report on a recent exhibition put on at Labassa (NT) by members of the Hornby Railways Collectors. In one room they had layouts of electric O gauge and Dublo while in another there was an O gauge clockwork layout using early track. Overall the exhibition was very successful and was well attended by the public who showed considerable interest. 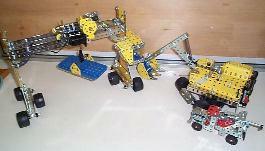 There is a possibility that the NT may be interested in a similar exhibition of Meccano next year. Carol Parsisson has finished the Annual Exhibition tablecloths and one was displayed at the meeting. A vote of thanks to Carol was carried by acclamation. 1) Sources of ideas for models. These comprise the world around us, Meccano Manuals, other Meccano publications (Meccano Magazines, Club magazines, CQ, and MW publications and ModelPlans) and offered to lend any of those that he has - please contact Graham on 9578 6850. Imagination can also play a part - some wondrous models have no existing prototypes. 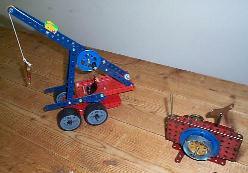 Recent French Meccano sets contain many such examples. 2) Colour combinations. 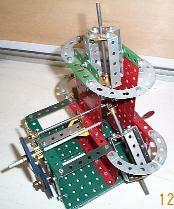 In addition to the regular Meccano combinations, other colour combinations can often greatly enhance a given type of model. Examples of these were discussed. 3) Modelling aids. Graham finds a towelling surface very satisfactory in modelling. The small parts do not fall off onto the floor readily, it is a user-friendly surface and can be washed as required. He also showed the variety of tools he uses in modelling, and outlined the advantages of each. He was horrified to learn that some members still use the regulation bent-wire screwdriver! 4) Purpose of modelling. 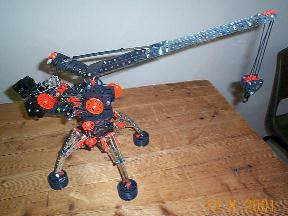 The enjoyment of Meccano modelling is primarily in the constructing, and in getting the thing to work! Once fully complete, that is usually the end of the matter, but for us, at present, we have the opportunity to show it at our forthcoming exhibition! He outlined our present situation in this regard - we have 60 metres of heavy black gabardine cloth for our tables, which will visually integrate the display magnificently. All we need now are the models! Ideally, exhibition models should be moving, they ought to work reliably and properly and have lights and sound where appropriate. Explanatory cards or pictorial matter are also appreciated by the onlooker. 5) He concluded by reminding us that mains motors should be properly earthed so that they are electrically safe. As an addendum to modelling aids, Patrick Russell-Young suggests the use of surgical forceps for retrieving parts that fall deep into the works. These can be obtained in all shapes and sizes from McFarlaine Medical Supply House who are in Canterbury Rd Balwyn. Well here we are at SkegEx 2001, day two, Spanner group photos just taken inside (weather surprisingly drizzly), but the atmosphere inside the Embassy Centre is just electric. It's difficult to summarise adequately, but wonderful, astonishing and utterly magic are words not too exaggerated to describe the general scene. Of course the dealers are here, and doing a roaring trade I would say, judging by the time it sometimes takes to be served - and the numbers of folks carrying out bulging bags, large and small! About a dozen dealers I would think. The Embassy Centre seems a fraction smaller than the Festival Pavilion, but I doubt the number of exhibitors or models is any less. Yesterday things were fairly well packed in - today, with the addition of yet more arrivals, all is VERY full! And so also the crowds - apart from a slight diminution in numbers through lunchtime, they are dense and never-ending. With their cameras, videos and digitals - goodness, you can't move without being in someone's way! Spanners are very well represented. I didn't think of counting the numbers, but of the order of forty to fifty - anyway, the pic will reveal all! Many of course from the traditional European Meccano countries, along with representatives from the US, Canada, Michael from Israel, Mark from Haiti - and even a total of five from Oz! As always, models from the tiny to the truly heroic, and all seemingly in great shape and behaving just as they should. I'm typing this at John Evans' laptop, behind two beautiful cranes, one tower, and one making total use of David Fellows' narrow angle girders and strips, the long slender boom of which would look quite hopeless built in conventional strips and girders. At least two other cranes are running in fully automatic mode through a sequence demonstrating all movements - wonderful for exhibition demonstration purposes, without having to be present ALL the time! Amongst the most spectacular models are a superbly presented French locomotive working flawlessly and looking the proverbial million dollars. A very large walking dragline with 9' (?) boom is similarly impressive, particularly in walking mode. Road vehicles of all types, locomotives, ships, fairground machinery - in fact the only Meccano category in relatively short supply seems to be ... steam engines! Some wonderfully clever mechanical devices and movements, and something new to me - genuine hydraulics. MOST impressive stuff this! Just which system is "best" is a hot topic it seems - be careful where you stand before opening your mouth!